It looks like this pic was taken with a full bank of lights but it was actually taken with a single strobe moved around the car for a total of 7 separate images. The images were then merged using a technique called Flash Merging. 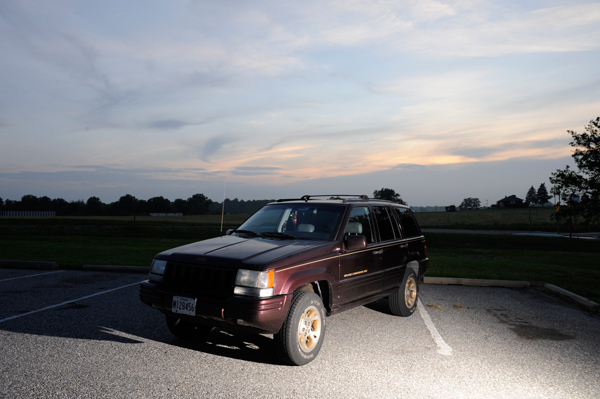 The 7 images were: 1 flash front, 2 flashes drivers side, 1 flash near camera, 2 flashes under car, 1 flash interior. Just to get a look at what the single flash looks like here is one of the drivers side flash. Notice the shadows created by the single flash are dark but in the merged image the same shadows are filled in by other flash positions. Also, one of the unique qualities of flash merging is that hot spots are removed in the merging process, notice the front blinker. If you decide you want them just blend them in later. Flash Merging is pretty simple, it’s quick and inexpensive too, that’s good if you don’t have the cash for a full bank of lights. The final image was shot using a tripod and Pocket Wizards, merged in Photomatix, I added a 40% vignette, removed some oil stains and did some sharpening. It would be lengthy to describe it here but you can get more info from my HDR book “The Complete Guide to Digital HDR Phototgraphy.” The publisher must have figured it was in demand in Spain and Latin/South America because it’s now available in English and Spanish. Thank you for this information. I’m anxious to try something like this. I have 3 strobe so I’m guessing I may be able to do this with a few less exposures. I love getting out there and trying new techniques! Thank you Ferrell! God, I’m so glad I don’t have to dress up in all black with clack face paint and run around a subject as fast as I can recycle, painting with my under powered strobe on a time exposure anymore! The sky is the limit to creativity with post capture HDR including selective filtering. I can’t wait until we have “true HDR” where the entire workflow is embedded HDR, capture, display and output. Computational photography has given us an avenue to get back to original intent of visual communication, which is to show what the human eye can see and perhaps go beyond that.